It is early morning. Quietness. Peace. Stillness but for the gentle, rhythmic rocking of the chair which has been made to do just that. And perfectly it does that which it has been purposed to do. Faithfully. The chair has weathered much in the past 11 years or so since it has come to be part of this family’s history. It was a gift. Ordered and delivered with impeccable timing just about two months before my daughter was born. Given by a very thoughtful Great Uncle, who although titled uncle since childhood, is in reality a cousin. A season of my life which can only be remembered as an abundantly lavish time of God’s amazing grace bestowed upon me. You see at this time I was a single Mom. Worse still I was a Christian, unwed, mom -to -be… about to spend the next two years as such. These two years were marked by deep intimacy with my Lord and Savior as He truly made himself my everything and showed me is complete ability to provide, restore, and bless me after being knocked off my feet as I walked along my narrow Christian path. He widened the path I was on and showed me His sufficiency and desire to love to the uttermost those who are His own. One of the ways I witnessed this provision was the Rocker I received as a generous baby shower gift from my “Uncle Cliff” from California. He made all the arrangements and I got to shop for the one I wanted and pick it out with much anticipation. After all this would be the chair I nursed my baby girl and rock her, I imagined gently to sleep. Little did I know that chair would experience this and much more as it solidified it’s place and purpose in our lives. The rocker alone is the last surviving piece of baby furniture from my little girl’s infancy. It remains steadfast and true. A reminder of grace, provision and the loving hand of my faithful & true Savior. These words from Jeremiah were emphasized daily in my life at this time. The Lord continually showed me that He desired my allegiance, attention, confidence and faith. He was weaning me from my worldly trust and focus to utter dependence on Him. Every decision of faith brought forth a provisional blessing. It wasn’t expected or anticipated yet received freely in amazement and joy! The Rocker also received me daily. We whiled away the hours together. There was the nursing schedule, the middle of the night feedings and the colicky night meetings. There were late night rendezvous and mornings when I woke up realizing I was still in the arms of the Rocker as my girl slept soundly head resting over my shoulder. 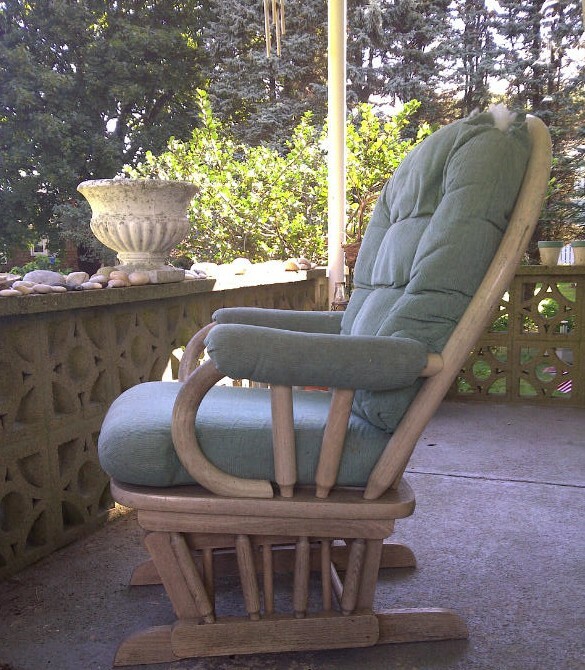 The Rocker became a sacred place in those early days of my mom-hood. As I comforted my crying baby girl and pleaded to God for help, sometimes silently, sometimes out loud, most times desperate. Always heard. The Rocker has journeyed to new places and from room to room as our family has changed over time. It has held each of us now for stories, family reading times, before bed chats and prayers. In the elementary years the Rocker held one lone parent (we would tag team) for those “I had a bad dream” and “scary monster” nights. One eye peaked back from the bed seeking that assurance of Mom or Dad’s presence. And one of us would stay rocking gently into the night peaking back through heavy eyes willingly offering up our sleep to give that assurance to our precious girl. Today this same chair is outside on our back patio. It is a bit worn. My mom reminds me I should replace the cushions. Stuffing is coming out at the top. But here, still I come…rocking gently back and forth in the early mornings, Bible and journal in my lap contemplating all God has taught me, seeking Him and praising the wonders of His love. This gift has become to me a Sacred Rocker. A welcome place to ponder the past, meditate on Truth, receive grace anew daily and anticipate the joy to come tomorrow. Dear Lord, you are a faithful companion. You are mysterious, wonderful and powerful. I am in awe of you and grateful that you are mindful of me. I praise you, Sovereign God, whom nothing is to hard for. You have guided me along this journey into parenthood and marriage. Into places I feared, you have brought blessing and grace in abundance. I thank you that You have become my excellent inheritance, and brought me to a good place. Not because I deserved it, no. Because you are a gracious, merciful and loving God. I pray all who read these words will come to know you and see for themselves your gracious, faithful, compassionate nature fully. In Jesus name. Amen. Wow! I will never look at my rocking chair the same again…This was beautifully written…and so full of the joys, fears, tears, comfort, and reassurances that show that God was with you all the way as you rocked away in your rocker. 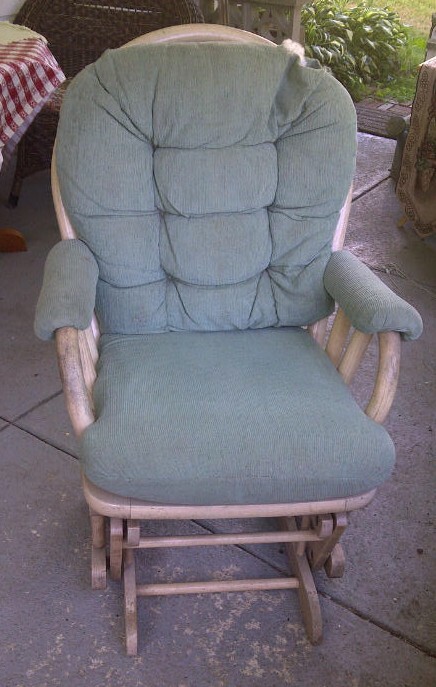 Your rocker looks so comfy! The one I chose for my first baby boy didn't have any cushions…how dumb was I? I still have it though, but I bought cushions for it several years ago, to get ready for grandchildren. I have one, but he is now 13+ and too big to sit in my rocker with me. Maybe someday the Lord will bless us with more grandbabies to enjoy the rocking chair with me. Love this post. Really touching. Thank you. Precious, precious, precious. In the hands of our Redeemer…NOTHING is wasted and none are lost. Bless you! Such a blessing of a post. Awesome memories of rocking my babies, and reminder of God's comforting arms! Absolutely beautiful post, as is your blog site. What treasured memories you shared. Stopping by from Fellowship Fridays and was blessed. Thank you! So beautiful Dawn. I love how a piece of furniture can carry our history so quietly and faithfully. Happy Mother's Day Dawn! I deleted first comment because it wouldn't let me edit it,Anyways, what a beautiful post, so heartfelt, brought me to tearsYou are so gifted as a writer! The rocker along with myFavorite bible verse just lured me in as It brought me backto those days with my babies…I miss them so! My only regret is I didn't know The Lord like I do now.. I like to think he was always with me, possibly pushing theRocker to and fro just waiting for me to come to him!